Phasor is a vary important mathematical concept used frequently for Alternating Current(AC) circuit analysis. I will try to explain some basic properties of phasors that you studied(or did not study) in school. My main purpose is to help you build up sufficient background for the next article to be published which is about transformer vector group. But in general understanding the phasor will help you in analyzing the AC circuits more efficiently. Just little middle school maths. In a 60 Hz system, in one second the voltage or current wave completes 60 such cycles. Any sinusoidal wave whether it represent current or voltage cycles or something else are actually represented in the form of trigonometric equation V= Vsin (x), where V is the magnitude and x is the angle covered. If we will start solving AC circuits using this type of equations then it will be extremely difficult to solve the large AC circuit problems. The concept of phasor is used to simplify any AC circuit problem. The beauty is that any sinusoidal wave can be represented by a phasor. The phasor is like vector. It has magnitude and arrow direction as shown in Fig-A. Remember that current or voltage are not vectors. 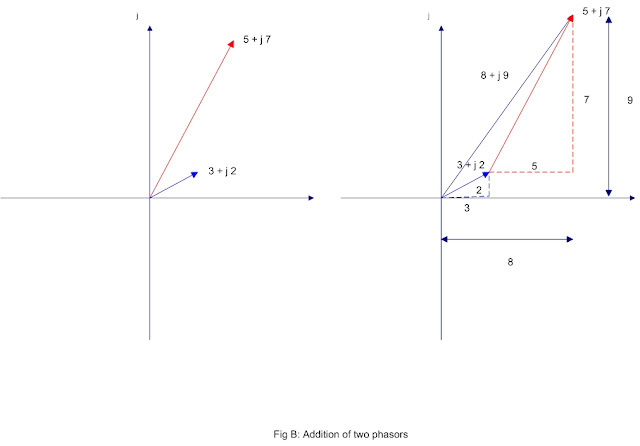 Phasor is a mathematical tool which has made calculations in electrical engineering simple. In mathematics the term complex number or complexor is used in place of phasor. 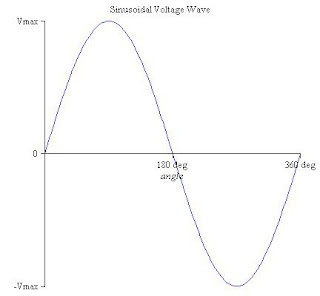 The sinusoidal voltage wave can be equivalently represented by a phasor rotating anticlockwise, centered at origin. If there are two voltage waves then they can be represented by two phasors, the length of each phasor proportional to the magnitude of respective voltage. see Fig-A. In the figure red and green phasors correspond to red and green sinusoidal waves respectively. Here in this case we have taken the magnitude of green phasor about half that of red phasor and the green phasor is 60 degrees behind the red phasor. As the phasors always rotate in anticlockwise direction, from the phasor diagram it is clear that the green phasor is behind the red phasor. In the sinusoidal waves diagram you may feel it confusing. Just think that red wave started its positive cycle at '0' degree (origin), but the green wave still have to go 60 degrees to start its positive journey. Also imagine that green wave will attain its maximum (Vmax/2) after rotating 60 degrees after red wave has attained its maximum (Vmax). 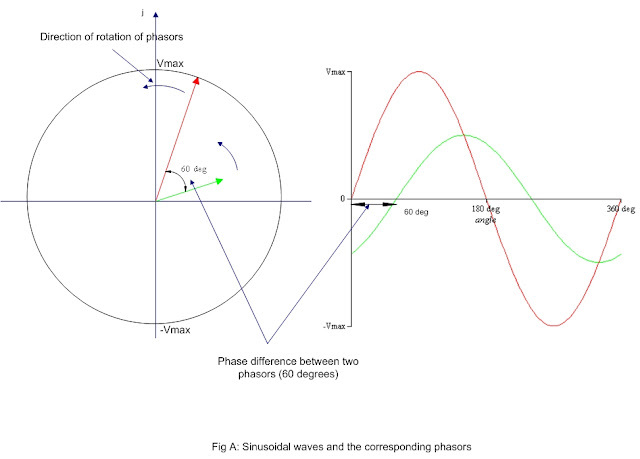 Carefully compare both the sinusoidal and phasor representation. In simple AC circuits the phase difference between voltage and current waves arises due to reactive circuit elements like inductors and capacitors. The angle of phase difference depends on the numerical values of the reactive elements and active elements (resistance). On paper, if you draw 1 inch phasor for 11 kV voltage then 3 inch should be the length of 33 kV phasor. Both these phasors rotating about the origin in anticlockwise direction. For 60 Hz system all the phasors will complete 60 rotations (or 60 cycles) in one second. The two phasors will never cross each other. The angle between the phasors the phase difference will never change as the phasors rotate. A phasor can be written in the form, A + j B. It is called Rectangular form (other is Polar form which we will not analyze here ). examples V1=3 +j 2, V2=5+j 7 etc. Two phasors can be added and gives another phasor. The two phasors can be added geometrically to get the same above result. One phasor's head is joined to other phasor's tail. Final or resultant phasor is the arrow from first phasor's tail to other phasor's head. see the Fig-B and analyze carefully. In this manner you can add several phasors to get the resultant phasor. I have illustrated the addition of five numbers of phasors in Fig-C below, you can add thousands (if you have time and patience). The phasors are just rearranged to get the resultant phasor R. I have taken the advantage of colours to better visualize. Remember you can add five phasors any order (without changing the direction and angle of each ), that means any one can be first and any one can be last, but still you will get the same phasor R (same length and angle). try it. V2-V1 = (5-3) + j (7-2) = 2+j 5. Remember that V2-V1 can be written as V2 + (- V1). Geometrically to find -V1, just reverse the direction of V1. Now add V2 to this reversed V1 to get V2-V1. Try it. Phasors can also be multiplied and divided. We will discuss whenever we require. I am concluding this session about phasor hoping that it will help you better understand the future articles in electrical systems. A phasor has a magnitude. Simply speaking it is the length of the phasor. It is a value. Symbolically the magnitude of the phasor V1 is written as |V1|. Superb as usual! Human inventiveness taking care of business, Salute to every one of them and on account of you for sharing, shadowy. These are absolutely stunning, I sense that I have been voyaging everywhere throughout the world !